Get hands on with our family friendly recipes and make this fresh twist to a traditional family favorite! Phyllo Crust: Thaw one roll of phyllo, following thawing instructions on package. Preheat oven to 3751/4F. In a small mixing bowl, combine egg white, oil and water with a fork. 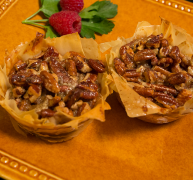 Open the phyllo and cover the sheets with a damp towel or plastic wrap to prevent drying out. Place one sheet of phyllo on cutting surface and lightly coat with egg-white mixture. Sprinkle with 1 teaspoon of Asiago. Repeat with nine more sheets of phyllo. 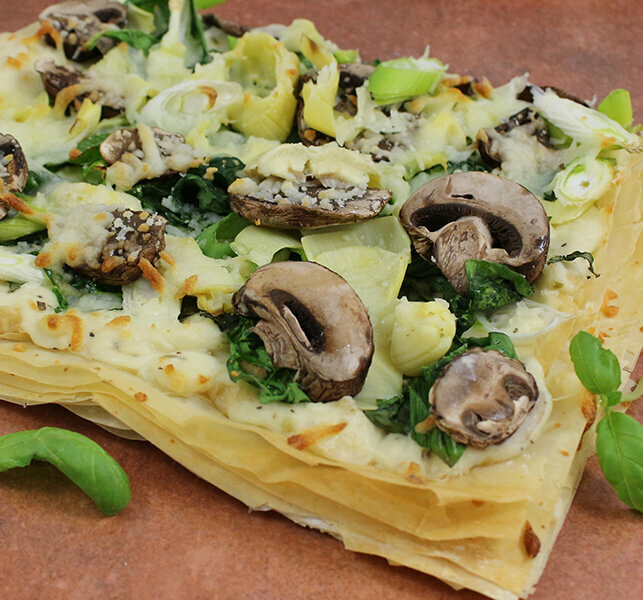 Cut the layered phyllo in half widthwise to create two pizza bases, and place on a baking tray. Reroll unused sheets and follow storage instructions on package. Bake for 8 minutes or just until the phyllo starts to brown. Remove from oven and cool. Sauce and Toppings: While crust is baking, heat olive oil in a medium saucepan. Whisk in flour, garlic, pepper and oregano. Cook for two minutes. Add milk and whisk over low heat until sauce starts to thicken, approximately 5 minutes. Spread half the sauce over each baked pizza base. Place toppings, manchego cheese and any leftover Asiago cheese on the crust. Bake on baking tray for 10-12 minutes. Remove and cut into pieces. Serve. Make the crust as instructed, but use jarred Alfredo sauce and top as directed. Maple syrup is nature’s best sweetener. Pair this with fall’s favorite nut, the pecan, and you can almost picture yourself enjoying this dessert amongst the evergreen forests of Vermont. 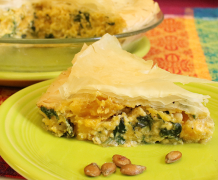 This hearty, meat-free pie features roasted butternut squash, Swiss chard and ricotta cheese, all nestled into a flaky Phyllo crust.